Two years ago we were having difficulty finding a groomer with the patience to work with our newly adopted rescue dog. Champo did not like scissors or electric trimmers or baths!!! To show his displeasure he would growl and snap at groomers. 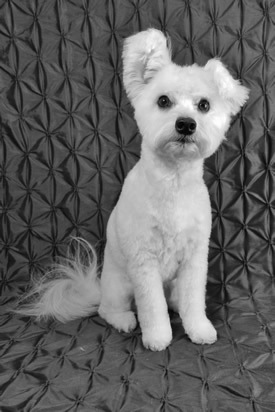 Feeling increasingly frustrated, we asked our dog’s trainer to help us locate a groomer experienced with rescue dogs and to help us develop a strategy that would encourage a new, more accepting behavior on our dog’s part. Without hesitation she recommended Marit at Send Rover Over. So prepared with some clever tips from the trainer and the willingness of Marit to work together with us to change Champo’s behavior, we saw our dog come a very long way. This progress would have been impossible without Marit’s patience and support. Now our dog is happy and struts around like a beautiful peacock after his grooming sessions. He looks great and smells great. He’s happy!-----We are happy!!! We appreciate the terrific service that the entire staff of Send Rover Over provides. They seem to really enjoy their work and their “clientele” and this shows in the high quality of their work. Thank you all !!!! Hi! We're Bella and Lulu. We've been visiting Send Rover Over for two years and we LOVE it! The ladies are nice and make us very pretty.